Buy 1 to 4 books and get a Diet Recipe CD free. Buy 5 to 19 books and get a Diet Recipe DVD free. Buy 20 or more to get bulk discounts. For sales outside the US, including India send us an email. The book titled as “Diet Therapy, a Few Recipes Related to Some Common Ailments” is focused on Indian vegetarian diet recipes. The book contains about 100+ exotic recipes. They are simple and easy to prepare ... right from raw salads & juices, boiled diet, soups, desserts ....to herbal drinks. 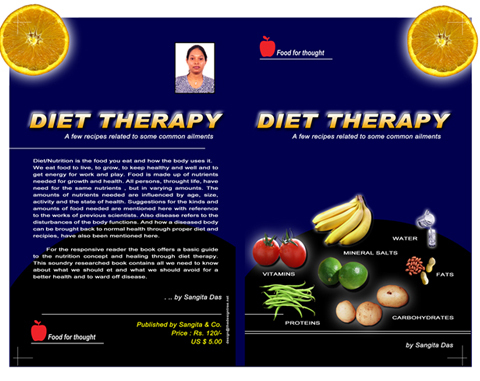 The book also offers a basic guide to the nutrition concept and healing through diet therapy.